With so many people wanting to be heard in a sea of social media, it’s not always easy to identify the quiet voices of those you want to build relationships with. I’ve blogged in the past about the importance of Social Listening as a way to cultivate engaging relationships with customers. But, it’s important to find ways to mute the multitude of voices and focus on those that really matter. So here’s how I do it. Not only do I have over 15,000 followers on twitter, but I also follow several thousand. No, I don’t have the time to monitor what everyone is saying. To be honest, I’m not even interested in 90% of what is said! Rather, I look for people who I can help, people who may be influencers or tippers. Typically, I’m looking for ways to gain access to people I want to do business with. Once I find someone of interest, I then go about separating them from the masses into small manageable groups, or as twitter calls them, ‘lists’. Rather than scanning through thousands of tweets, I am able to focus on those that really matter. 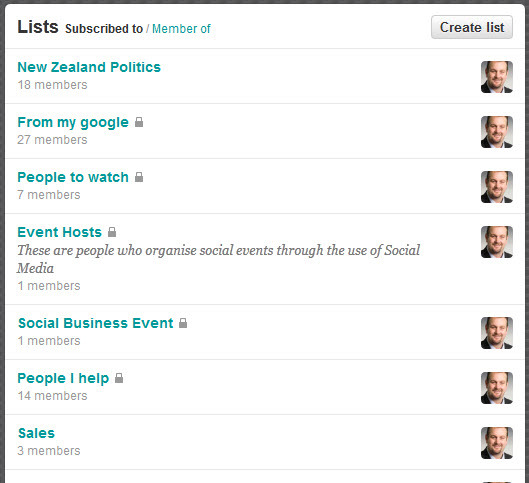 In some cases I mark my lists as private so that they cannot be followed by other people. Private lists help to protect my competitive interests. The greatest benefit of lists is that they will help you to increase productivity. You’re able to hone in on people who really matter to your business.